Complex compositions and a new dispersoid phase have been revealed for the first time in aerospace aluminium alloy by LightForm researchers. Dispersoids are used to control the grain structure during thermomechanical processing. Modern aluminium alloys usually contain zirconium (Zr) for the purpose of forming dispersoids. It is usually assumed that these dispersoids, which have an ideal composition Al3Zr do not interact with the major alloying elements such as zinc, magnesium, and copper. We used the capability of the TITAN ChemiSTEM at Manchester to study the composition of dispersoids in AA7010, an aerospace aluminium alloy, at the atomic scale. This has enabled both the composition and distribution of the alloying elements in the dispersoid to be studied for the first time. 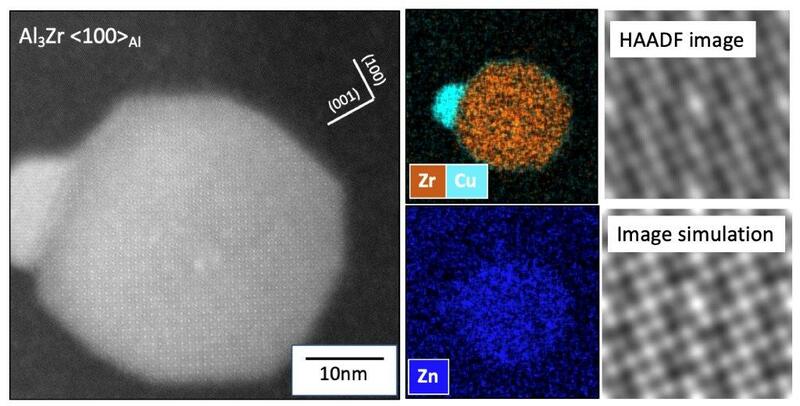 We have shown that along with Zr, the dispersoids are also enriched in Zn and Cu compared with the matrix. We have measured Zn levels in the dispersoids up to 15at%; a significant concentration. We have also identified a new dispersoid phase by atomic scale imaging and image simulation with a tI10 Ni4Mo structure type never before reported in these alloys. This is believed to be favoured since it enables incorporation of higher levels of Zn into the structure.